Miranda Ellis is a woman tormented. Plagued since birth by a strange and powerful gift, she has spent her entire life struggling to control her exceptional abilities. Yet one innocent but irreversible mistake has left her family’s fortune decimated and forced her to wed London’s most nefarious nobleman.They will burn for eternity . . . Kyaaaaaaa!! Wait, let me rephrase that in a non-fangirling, non-emoticon/animted-gif inducing manner [read someone’s opinion that they make your thoughts not a review at all *snort*]: awesome reading!! Gorgeous reading, in fact. Yummyficent 😛 [made up word as well, there’s people in the audience swooning, I’m sure]. The setting: London, 1880’s. The characters: one tortured man, wearing a mask to hide what he believes is disfigurement (while reading, I didn’t see it as such, just as…transformations, but I’m not spoiling your read for you with the details), one sharp, witty, charming young woman hiding what she believes may be a monster behind her beauty. 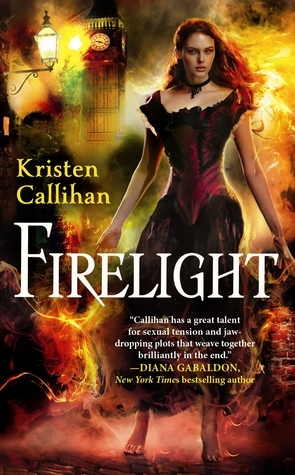 Add in some some quirky sisters, secret societies and quests to obtain the unobtainable, a lot of really good writing and great chemistry, and you get the awesome: Firelight. The writing was absolutely charming, imbued with that classical beauty that I always fall for. A mature voice, great imagery, emotionally captivating scenes and what I felt was absolutely beautiful character-building – reading this book has been a complete pleasure. The plot, original and fresh, veers into the paranormal through rare if not unique creatures, not much of the regular fang-tastic in here; you’re dying to find out, aren’t you? Get it, read it, love it, I’m not spilling. It’s part of the charm to be wondering, I mean I was dying to know just what was under Archer’s mask. I will admit to having some suspicions that it would be a modern version of The Phantom of the Opera perhaps, and I kept looking for signs of it, but I didn’t find anything pointing me much into that direction, so I felt better about the odds for a happy ending for the man with the mask. There was of course a moment when things looked pretty bad, like there was going to be a crying fit for me at the end, but I’m going to tell you, without details or anything, that it has a happy ending. For everyone that was terribly sad about the masked man that never finds happiness, well Archer finds it. It’s questionable if we can say the masked man does as well, I mean…yeah, too spoilery if I tell you. The part I loved the most (aside the writing, did I mention the writing?) was the relationship between Miranda and Archer. It developed beautifully, it felt absolutely natural, not like an instant-love thing as it sometimes happens with romance, and the mystery between them, all that yummy tension made them my favorite couple I’ve read about so far this year. Ok, it’s just January now, I know, but I have a feeling they’ll remain in my top 5 even if you ask me about it in December. So, all in all I say you should definitely read this. It’s a mature love story, a mature relationship between mature characters (thank gods!! ), it’s intriguing, engaging, a delight to read and a pleasure to experience. Read it, I say. Read it.